What is a ‘whistle post‘ you may ask! The Victorian Railways installed specific posts to alert engine drivers that they were approaching a ‘PCR’ (Public Carriage Roadway) level crossing. The driver was required to sound the train’s whistle at such a distance back from the crossing, to give ample warning of the approaching train. A ‘whistle post’ was installed on the driver’s side of the line, at a specific distance from each side of the crossing. Within the new O’Keefe Rail Trail section crossing Lake Eppalock, there was originally a railway level crossing of the Derrinal-Crosbie Road. This section of road was flooded by the lake’s construction in the early 1960s, as too was the railway. The new O’Keefe trail now crosses that exact location of the former road crossing point, so the Friends of the Bendigo-Kilmore Rail Trail’s Project Team decided to identify the location. How? By installing two replica whistle posts. Member Ken Hanson sprung into action, sourced materials and manufactured the two posts. 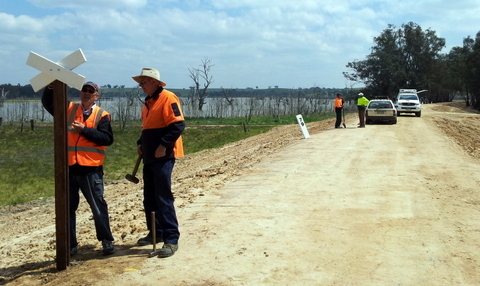 With the assistance of the Friend’s Project Team members, the two posts have been recently installed on the O’Keefe Rail Trail’s new Lake Eppalock Causeway (note: the causeway is not currently open to the public, until construction is completed). These posts highlight the former road crossing, which otherwise is not easily recognised or even identify depending on the lake’s water level. Another Friends’ volunteer project completed, to provide future trail users with a link to the past. As can also be noted on the photo, a replica 79 mile marker post has been installed by the Friends, adjacent to its original location near the former Derrinal-Crosbie Road level crossing.